The most advanced Android-based tablet from LeapFrog, the Epic is uniquely designed to grow with your child and ignite endless learning and creative play. Designed for children 3-9 years old. Excite your kids with a virtual world they create on the LeapFrog Epic 7" Tablet. Manage what, when and how long each child plays with best-in-class parents controls for up to 3 profiles. 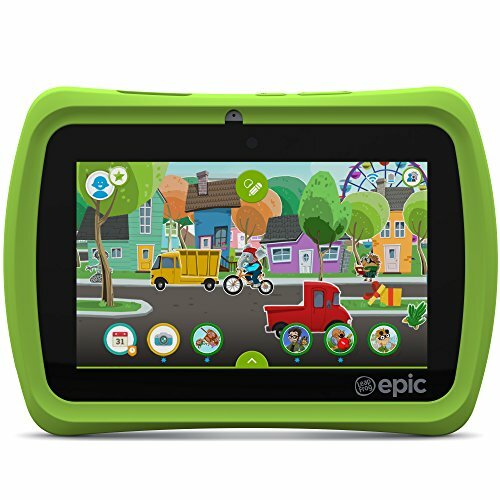 Exclusive to LeapFrog, the LeapFrog Epic 7" Tablet includes Just for Me Learning technology that personalizes select games to challenge kids as they grow. Dive into over 20 kid-favorite android apps and the world-class kid-safe web with the LeapSearch browser. Easily add websites to your Epic tablet as your child matures. This tablets durable design is complete with a shatter-safe LCD screen and protective bumper for everyday drops and bumps. Includes a powerful quad-core processor, robust 16GB memory, vivid 2MP cameras and more!